It often astounds me how little we learn from history (and by “we” I mean we human beings: any culture on this planet!). If you need reminding, I mention the massive immigrant / refugee crisis of the late 1800s and early 1900s, when hundreds of thousands of (mostly European) immigrants sought a better life in this country. Sound familiar? 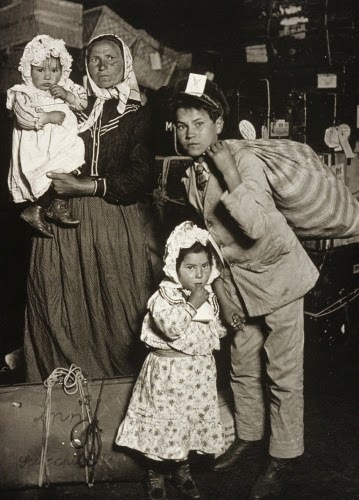 In the late 1800s and early 1900s, Italian and Irish immigrants were particularly “not wanted,” and many who came, with no money or job skills, were detained and deported. Artists have always documented these periods. Lewis Hine was a photographer at the turn of the century. He wanted to bring to Americans’ attention the hardships these immigrants faced, as well the deplorable conditions in the places they worked. The flood of immigrants from Europe at the turn of the century gave rise to overcrowding and poverty in large American cities. Lack of jobs and housing created terribly overcrowded tenements and homelessness. Lewis Hine was perhaps the greatest of the photographers concerned with social reform. After graduating from Columbia University in 1903, Hine began teaching at the Ethical Culture School in New York. The school trained people to help serve the less fortunate and improve their lot in life through public service. In 1905 Hine’s boss gave him a camera as a teaching aid and to record school activities. His interest in social reform led almost immediately to his first documentary series in the same year. He set out to document the uncaring treatment of immigrants on Ellis Island. This photograph comes from that series. In 1908 Hine quit teaching to become a photographer and investigator for the National Child Labor Committee. Between 1908 and 1916 he traveled widely, documenting child labor abuses. Hine called his photographs “photointerpretations,” because he felt that they were interpretive. Later scholars, however, consider them documentary. Hine used photographs such as this one as lantern slides for his lectures, as well as to illustrate pamphlets and magazine articles. His photographs were instrumental in passing child labor laws. As a creator of social documentary, Hine refined the genre by producing photographs that capture the dignity of his subjects by the way he framed and lit them. He continued to photograph workers and laborers until his death. Interest in his work revived during the 1960s when the issue of social reform again came to the fore. This photograph documents those who were relegated to the Baggage and Dormitory Building of Ellis Island. It was basically a detention, and most likely deportation, center. After the Immigration Act of 1924, regulations were much stricter on who was allowed into the US. Hopefully, this family was lucky enough to qualify to enter.